Houdini made the only known recordings of his voice on Edison wax cylinders on October 29, 1914, in Flatbush, New York. On them, Houdini practices several different introductory speeches for his famous Chinese Water Torture Cell. In the trick, Houdini’s feet would be locked in stocks, and he would be lowered upside down into a tank filled with water. The mahogany and metal cell featured a glass front, through which audiences could clearly see Houdini. The stocks would be locked to the top of the cell, and a curtain would conceal his escape. In the earliest version of the Torture Cell, a metal cage was lowered into the cell, and Houdini was enclosed inside that. 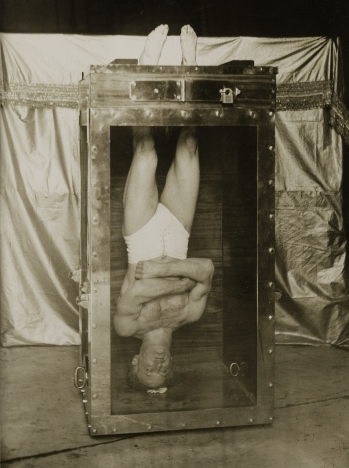 While the escape was advertised as “The Chinese Water Torture Cell” or “The Water Torture Cell”, Houdini always referred to it as “the Upside Down” or “USD”. The first public performance of the USD was at the Circus Busch in Berlin, on September 21, 1912. Houdini continued to perform the escape until his death in 1926.